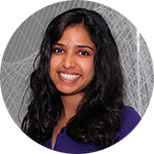 At IHME, Rashmi was a member of the Effective Intervention Coverage and Burden of Disease project teams. After IHME, she moved to California to pursue her medical degree at Stanford University. Pullan RL, Smith JL, Jasrasaria R, Brooker SJ. Global numbers of infection and disease burden of soil transmitted helminth infections in 2010. Parasites & Vectors. 2014 Jan 21; 7(1).